Guess what time I woke up this morning and guess what woke me up…Yep, at 4:30am I got my daily rain wake-up call. No wonder I’ve been going to bed early when I am being woken each morning before 5am. I do my best to go back to sleep, but I usually have to go to the bathroom first thing when I wake up. Once again, the umbrella saves the day with using the bathroom in the rain! The good news is that the rain today was a light mist or rain on and off. There was little wind with high humidity and temperatures in the upper 50s/14.4C, so it was not as chilly as it has been at all. What are these big lumps in the ground. Do snakes live in there!? I did a bit more miles yesterday because I knew the rain was coming today and maybe tomorrow. I wanted to give myself flexibility to do less if the rain was bad. In this section, there was a fire in 2015 that destroyed a 66-year-old trestle bridge that was beautiful. Here is a link to more about the bridge and some incredible photos including one of the fire as it approached the bridge. The bridge runs over the Murray River that I have been paralleling for the past day. There is a diversion (reroute) because the Murray River is high enough right now that it is possibly not safe to cross. 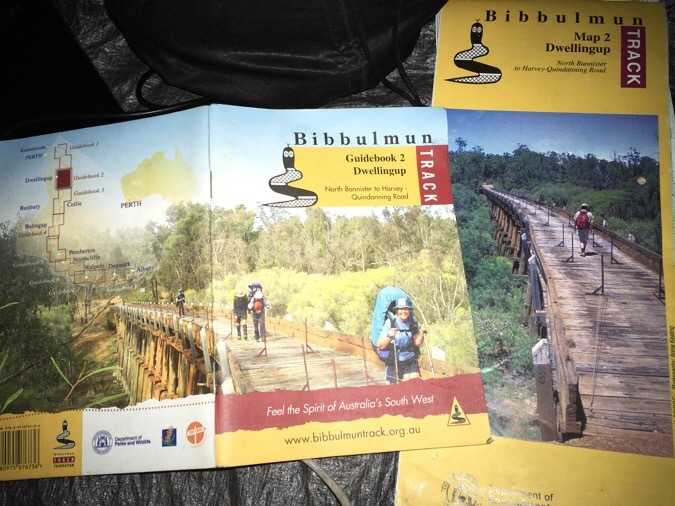 Photos of the Long Gully Bridge on the Bibbulmun guidebook and map for this section. With all the rain, and this reportedly being the rainiest season they’ve had in 20 years (I read somewhere that it is the longest winter they’ve had in 60 years whatever that means) the diversion makes sense. However, it is up to the discretion of each individual hiker to decide if they want to attempt the crossing and not take the diversion. There is a woman two weeks ahead of me on the trail named Turtle who is my age and has been very helpful in providing me tips and resources for doing this trail as I go. 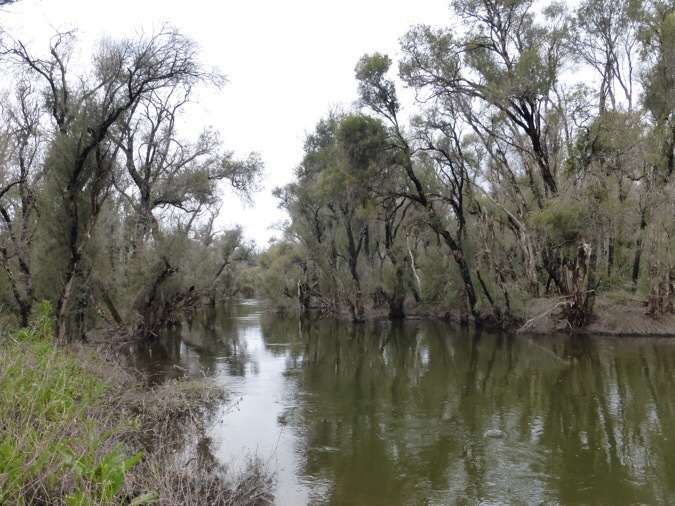 A couple weeks ago, she was able to cross the Murray River and did not do the diversion. Given all of this rain, and the cold weather, I had decided not to do the crossing and to accept the diversion that adds a couple hours of hiking and misses 9mi/15km of the Bib. Though, right before I left from Dwellingup, Turtle did send me a photo of the crossing that made it even more enticing because I was able to see that it was something I could do. Still, I left Dwellingup intending to do the diversion since it was the sure bet. Today was the day of the diversion. I will preface this by saying that I am a terrible reader and I tend to miss details. I have seen the signs and warnings about the upcoming diversion, and I even loaded it onto my phone, but I tend to look at things one section at a time because it’s overwhelming to take in too much and it all gets jumbled. Just add maps to look at as well, and I’m a total mess. That’s why I try to keep it as simple as I can and only look at details ahead when necessary. When I had glanced at the diversion, the description mentioned it being between Dookanelly and Possum Springs shelters. I knew the general gist of it and figured I’d sit down and look at it when I got to Dookanelly this morning. It was then that I realized that the diversion had started 2mi/3km back. I had not even noticed any signage for it! Most people rely solely on the shelters for camping and water, so I guess many are coming to Dookanelly, spending the night, stocking up on water, and going back to get on the diversion. Now that I was looking at it, and saw that I had passed the beginning of the diversion and would have to walk back (and the distance given for the diversion seems shorter than the map looks), the diversion was seeming less and less enticing. I sat for awhile and really looked at the maps and decided to go for it. I was going to attempt the Murray River crossing. The crossing was 12 km away, and I knew that if I had to, I would turn around and walk back. I had plenty of food to be able to do that. Some of you may wonder why I feel the need to do a crossing when there is a diversion in place. A couple of reasons, but mainly because of the PCT 2011. That experience in the high snow year and the high water crossings taught me that there is a lot of fear mongering and fear of the unknown in hiking. Sometimes I just need to walk up and see it for myself and make the decision for myself what I can and cannot do. It doesn’t mean everyone would make the same decision, but I need to decide what I’m comfortable doing. I knew this crossing was not in the comfort level of most on this track and that’s completely ok. In my gut, this crossing seemed like something that was completely within my safety zone. 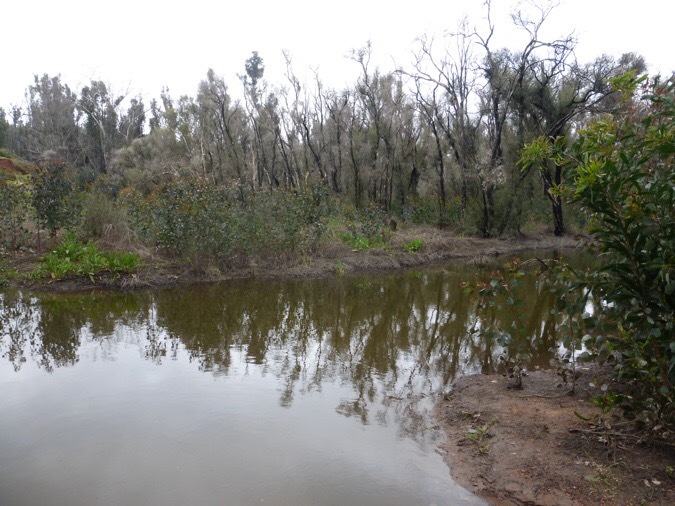 There was a small part of me that was concerned that the great deal of rain lately may make it impassible, but my gut was telling me that from what I had seen already of the Murray River, that I could do it. 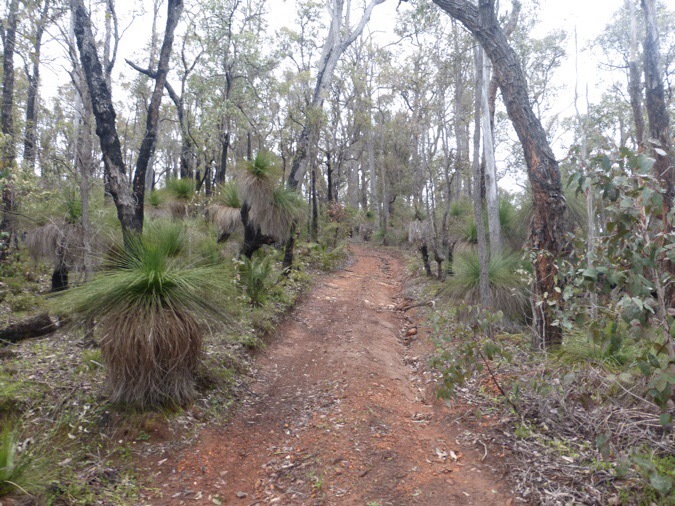 The trail on the way to the Murray River was a steep up and down on an old road and then a wet brushy overgrown trail that soaked my feet. I figured that was the sign that I’d be leaving my shoes on for the crossing since they were already so soaked. When I got to the crossing, I knew I had done the right thing as soon as I saw it. Two bonus things happened that really sealed the deal. 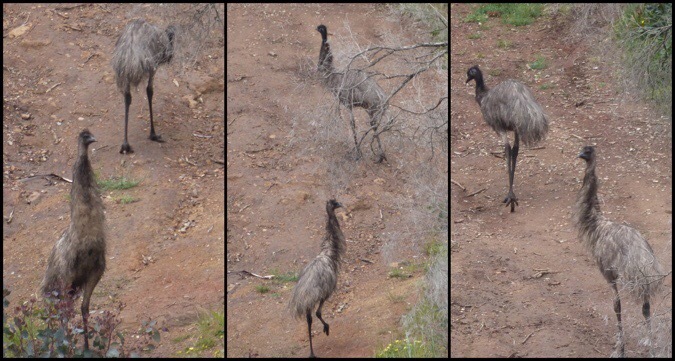 One is that immediately when I hiked up and saw the crossing, I saw two emus on the other side of the river! I got photos and video before they realized I was there and ran and off. I was in the right place at the right time! The other thing is that the sun was shining through the clouds and made it warm all of a sudden. I knew that wouldn’t last but maybe a few minutes, so I worked quickly to get stripped down and shove everything inside the trash compactor bag I have lining the inside of my pack. The crossing was split into two branches with an island in the middle thankfully. I doubt I would have done it if it was much wider than it was split. Murray river. Hard to make out, but the first branch is the further water. The first one was the wider of the two and I would say it was about 15m wide. I went upstream just a bit because I knew the current, which was very slow-moving, would gradually push me down stream and I could see where I wanted to end up. I will mention that it was warm enough that when I stripped down, which I’ve never done for a crossing before, I was actually warm because of the sun. Go figure. I got in just a bit upstream from here. I was able to walk in and it gradually got deeper. I pushed off the bottom and swam kicking my legs and arms as quick as I could to get me across as the current slowly pushed me down stream. I only had to swim for about five seconds, and then I was close enough to the other side where I could reach the bottom again. Anyone reading this wanting to do it themselves, know that I am 5’3″/160cm. I was surprised that the water wasn’t cold. More like a lukewarm puddle kind of cold. Know that I don’t like cold water at all and I wasn’t even shivering and felt warm when I got out. Adrenaline is a funny thing. The second branch was much easier. I still went upstream just a bit. I only had to do a couple of strokes in the middle, but for the rest of it, I was able to just push off the bottom and keep bobbing above water. Second branch looking back to where I crossed. I did wear the pack unbuckled the whole time and it floated really well. I had experienced this before on the PCT crossings, so I knew what to expect as far as the pack. I can’t say all packs are the same, but I knew what mine would do. When I was done very little was actually wet. Just the hip belt, the bottom of the pack, and the pack’s back pad. I kicked myself because I had intended to put my removable back pad inside the pack and it was wet, but it dried within an hour. This whole thing was a good little adventure for me and I had fun with it. It definitely got my adrenaline going for the first half of the day and I was pumped! I did grab water from the river and filtered it into my bottle that was partially full. It wasn’t until after I did that that I drank it to realize that it either had a high mineral content or something else, because it tasted like salt water. I decided not to drink anything until I got to the next shelter which was about an hour and a half away. That wasn’t a problem given that it was cool out and it started drizzling again soon after I walked away from the river. Perfect timing! 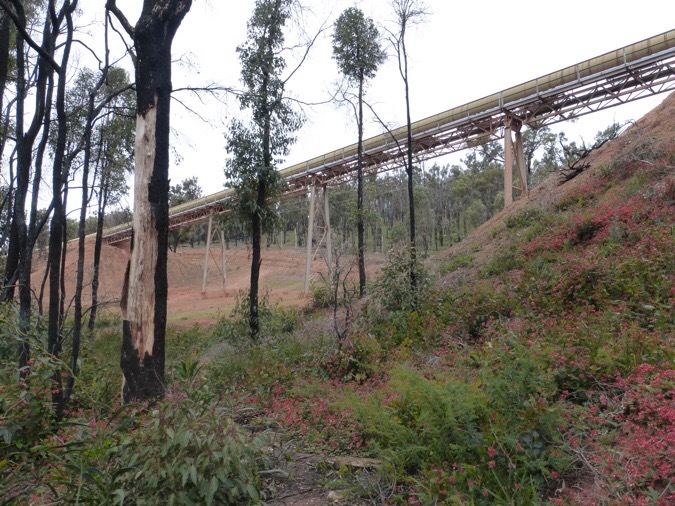 Just after the river, I walked under a mining conveyor belt for bauxite (to make aluminum). That must be the sound I’ve been hearing that sounded like some kind of motor or traffic-way in the distance. It is quite loud and maybe it is the mining that is causing the taste of that water. 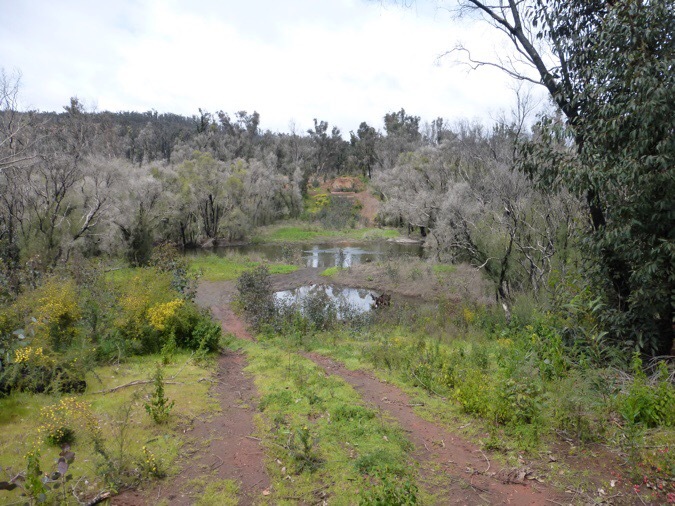 I did read that two of the shelters in this area were built by volunteers from that mining corporation and that they were a major sponsor of the Bibbulmun Track Project back in 1996. Interesting. One thing I want to note about today is that the whole day I was following a motorbike track. I was surprised because it was a more narrow trail today and I thought they would stick to the roads. Someone actually road the trail. I got to Possum Springs shelter for a late lunch at 2pm. While I ate lunch, the sun came out and I actually saw some blue sky but it only would come out for a couple of minutes and then return a few minutes later. I was able to dry out the tent though. The next shelter was just barely far enough away that I will not make it there tonight. I can see that another end-to-ender, an older man from a nearby town, is ahead of me and staying there tonight. I will meet him in the morning. The hiking the last few hours of the day was really enjoyable. There were signs of blue sky for a bit on and off. I do love clouds. I try not to plan out the days very much and just walk, so I ended up doing enough miles today and yesterday that I will actually make it to town tomorrow! It will require a big day, but it will be good motivation for dinner in town and a hot shower to end the day. Since I just stopped in Dwellingup, I won’t spend too much time in Collie. There are many towns in the upcoming sections, but I won’t be spending a lot of time in them. They can be vortexes for time and money so I try to space out my extended town stays for when I need a rest or there is poor weather. This was such a short leg that I don’t really feel like I need time really in town. It will be nice to sleep in a bed and recharge things though! I got a video of two of these. What is it? 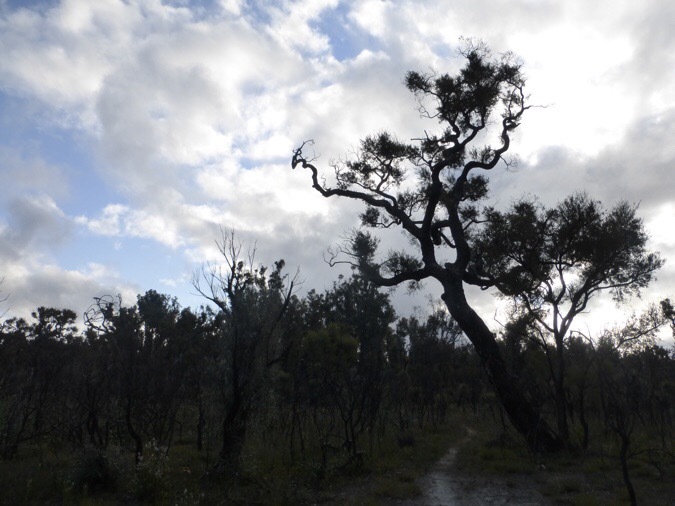 ​When it got to 6pm, I chose a spot that was flat and not muddy under a sheoak tree. That was a great tip from Marcus to find these spots. It’s great! Another thing I’m glad Marcus warned me about was the sound a kangaroo makes when curious about your tent at night. There is nothing out here that will harm me, but hearing those thuds from a kangaroo jumping around and breaking sticks and in the leaves can really get the mind spinning! He’s gone now. Oh, I saw two roos yesterday morning and one late today. Just haven’t been able to get a photo. I think I saw a pig bolt up a hillside a distance from me. Whatever it was wasn’t big enough to get above the low shrubs but it moved quick. Well done for crossing the river. Your a brave girl. How exciting. 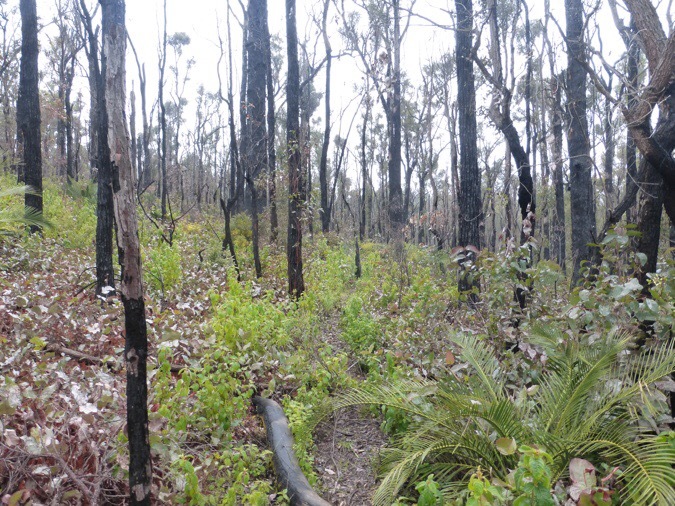 The first lump is most likely a termite or ant hill and the bird in the last photo is a cockatoo (maybe a white-tail). You are currently camping on the 10km section that I maintain so I hope it is all rubbish free and easy to pass through. Last time I was there in late August we came across a blind kangaroo (his eyes were white and kept bumping into things), I hope he doesn’t accidentally jump into your tent. Thought you might enjoy the long expanses of 4×4 track to get some chores done. Oh, and on the Larapinta the termite hills were tall cones. Also, I didn’t think the shelters would be made of wood if termites were so prominent. Welcome to this side of the pacific. Long time reader of your journals. 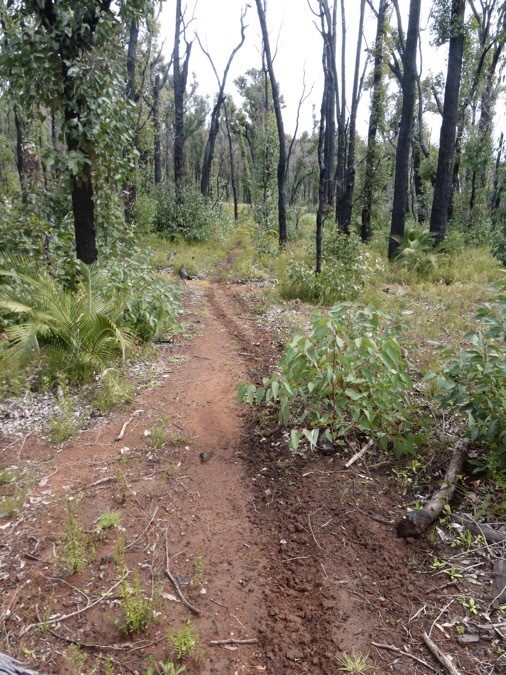 The large mud piles in the trail are I think termite mounds. And the bird is a type of black cockatoo. Disappointed with the number of vehicles- cars and bike you are finding on the tracks. Not that you’re not daring and of course hate to retrace your steps unnecessarily. You are really practical, though, and always willing to stay flexible and challenge yourself – good life qualities for on trail and in life in general. I do get all the considerations you explained, but you couldn’t really know the depth by just looking and with all the recent rain. So glad it looked doable, was doable, and all is well. Erin congratulations on your river crossing! I have watched several youtube video’s of Te Araroa river crossings and they look really dangerous. The guy I saw was at least 5′ 10″ and he was up to his chin! We don’t want you to drown or be swept out to sea by the tide……. Oh yeah, this TA ones are not to be messed with. There are road walks around if they are too high. Congrats on the successful river crossing! That black cockatoo is male and likely to be either the Baudin’s or Carnaby’s Cockatoo both of which are endangered. They look similar but you can tell the difference by the call – the Carnaby’s make a very loud and awesome shriek sound. These are different to the Red Tail Black Cockatoo that you saw earlier, which are not endangered. I’m trying to upload the video of them and it keeps failing, but it was like the loud noise of a balloon being deflated and squeaking. Yes kangaroos can be very loud when they thump around your tent at night. 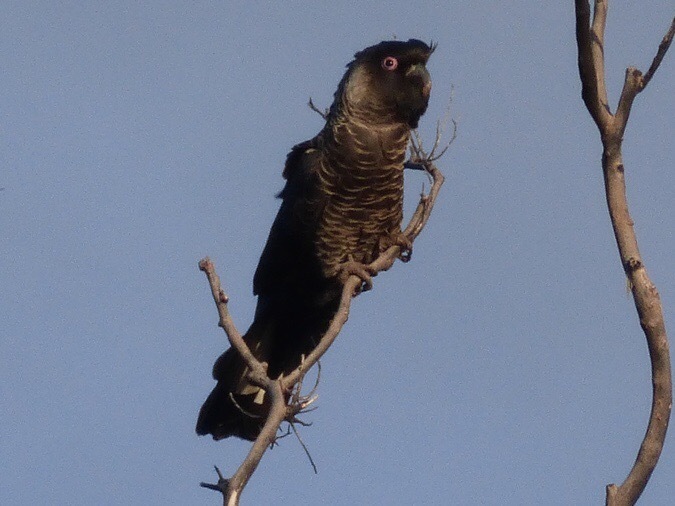 And as others have said the bird is a white tailed black cockatoo of which there are 2 species in Western Australia. Its been a very wet spring in southern Australia this year – floods where I live in South Australia. 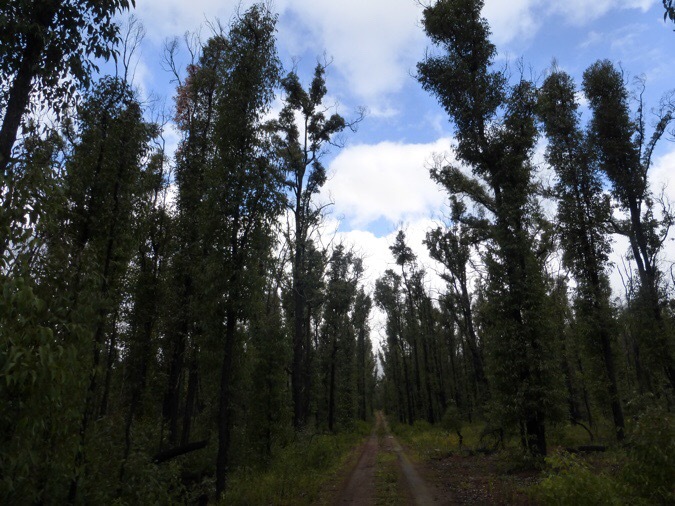 Your photos of the blackened eucalyptus forest brought me a pang, it so typical of the bush we go walking in here. Good work with the Murray! 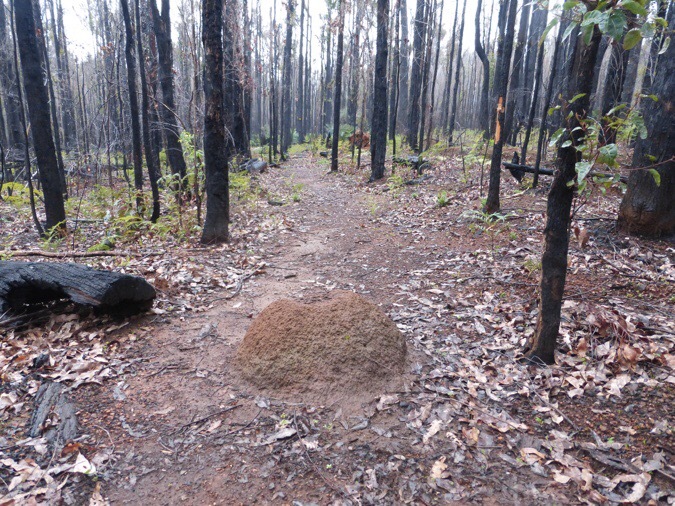 Possibly a termite mound? Amazing that you swam the river, what with snakes and all. Fun reading your adventure. Yeah, totally thought of snakes! 5ft3″? You are more like 6ft3″ to me, Erin .. but I have found just the same myself, it is amazing what you can do if only you convince yourself you can. I like the way you think about the risk and then take practical decisions. Intrepid, not least for trying to drink out of that river! .. that bridge is such a very sad loss. 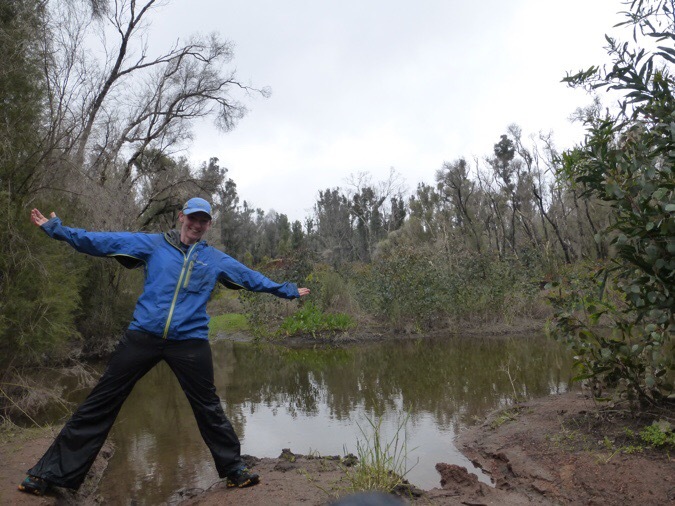 I’m 5’3″ as well and I got quite the heebie jeebies during your river crossing! I kept imagining the scenes from Crocodile Dundee, ha! Stay safe out there. So, I love the bird and the emus.. I would have incorrectly guessed a variety of parrot, but I can see cockatoo once it was pointed out. So nice reading all the comments. I enjoy so much your details, the why of what you do, what you do and how you go about doing that. It make for a dimensional read of your blog, for me. Having Turtle ahead of you has to be so helpful, too. The major quake warning prompted me to order some Mountain House meals and I stocked a small amount of Larabars. When you are in the U.S., is there a go-to source that is best for Mountain House? I stuck with Amazon since I get free shipping. Yeah, I just tend to get the 10 cans through amazon as they are bulk and more bang for the buck. Thanks! Hoping to never need them, but you never know. It looks like it might be a Carnaby’s Black Cockatoo and if so you have done well as it is a threatened species. I got video too that I can’t get to post, argh! Errr OOPS……..I should have read all the posts seems the possible ID’s appears earlier in the replies. Erin, you keep stepping it up. You must feel really alive!! Bully for you. Really enjoying this track.